History Sparkles in “Treasures from the Collection” at The Morris County Historical Society ~ The History Girl! There’s something for everyone to enjoy in the Morris County Historical Society’s new exhibit “Treasures from the Collection,” now featured at Acorn Hall through September 1, 2015. See everything from clothing to documents, militaria to fine arts, and furniture to photography, and more in this treasure trove display from Morris County, and beyond. Highlights include heirlooms from notable local families such as the McEwans, the Condits, the Lindsleys, and the Bonsalls, and spectacular stickpins from the remarkable collection of MCHS Board Member Emeritus Learned T. Bulman. 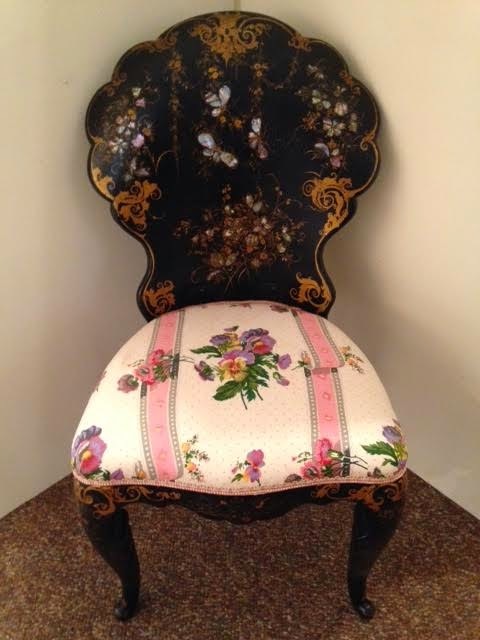 19th century papier mache chair, MCHS collection, courtesy of Janis Cunningham-Coneys. Pieces from across the country include an 1876 ball gown worn to the Centennial Celebration in Washington, D.C., an assortment of 19th century U.S. flags, a scarab stick pin from the reign of Ramesses II, and various 19th century weaponry and artifacts related to the Civil War. Compare earlier fashion trends to the haute couture Pucci-inspired mini-dress, circa 1960s. For the furniture aficionados, marvel at a Victorian-era papier-mache chair, a mahogany Chippendale chair, and a Hitchcock-style chair from Morristown furniture maker, H. Frazee. Travel with ease to faraway Japan, and experience Asian art in the form of wood block prints and porcelain vases. Admission to tour Acorn Hall and to see the exhibit is $6 for adults, $5 for seniors, and $3 for students. Children under age 12 and MCHS members are free. To view the exhibit, only, is one half of the admission.